Vision X bulbs are superwhite, not the standard orangy-yellow color, for a more natural light color that increases visibility, provides for better depth perception, and reduces eye fatigue. 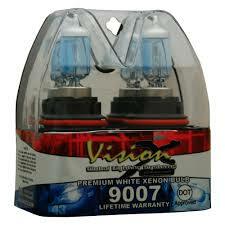 These Vision X halogen bulbs feature a B1 coating to provide a superwhite light while still being fully DOT approved. This line features automotive bulbs that will shine brighter and further down the road than standard bulbs..